Today's installment on the blog features the lone Canadian NBA team. 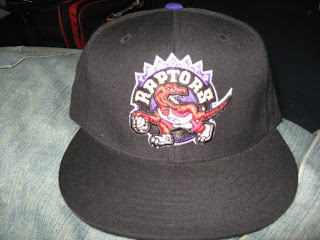 The Toronto Raptors are the only team north of the US border after the departure of the Vancouver (now Memphis) Grizzlies in 2001. These two franchises were originally meant to be a mainstay in Canada for years to come, but basketball just didn't catch on as well in Vancouver. In any event, the Raptors are in their 15th season of NBA competition and their tenth in the beautiful Air Canada Centre. Prior to 1999, the Raptors played their home games in the Toronto Blue Jays venue the Rogers Centre. Playing in the Atlantic Division of the Eastern Conference is no easy feat for any franchise, let alone a new one. This being the case the team struggled early on, until the arrival of Vinsanity, Vince Carter. As soon as the North Carolina shooting guard showed up, so did fans, and victories. The team found themselves in the playoffs in three of carters first six seasons. since then, the club has won one division title in 2006-2007, but has still yet to win a conference or NBA title. The recent departure of Raptor favorite Chris Bosh to Miami has left the team faceless, and in need of a new leader. Roster players such as Andrea Bargnani, and recently acquired Peja Stojakovic seem to be the call to the need, only time will tell if they will be the answer. Find all your Raptors gear at the link below, and come back tomorrow to see what exciting team will be featured. See you all then!